Performance Series, Drum Set from DW Drums. Drum Workshop Inc. recently announced the addition of a mid-priced production drumset to its line of custom-built DW branded drums. The new series features a proprietary drum shell called HVX, referring to its grain orientation made up of horizontal, vertical and diagonal plies. The 8-ply all-maple shells, made from North American Hard Rock Maple, are said to provide a low-mid frequency range with punch, articulation and are designed for a variety of musical applications. 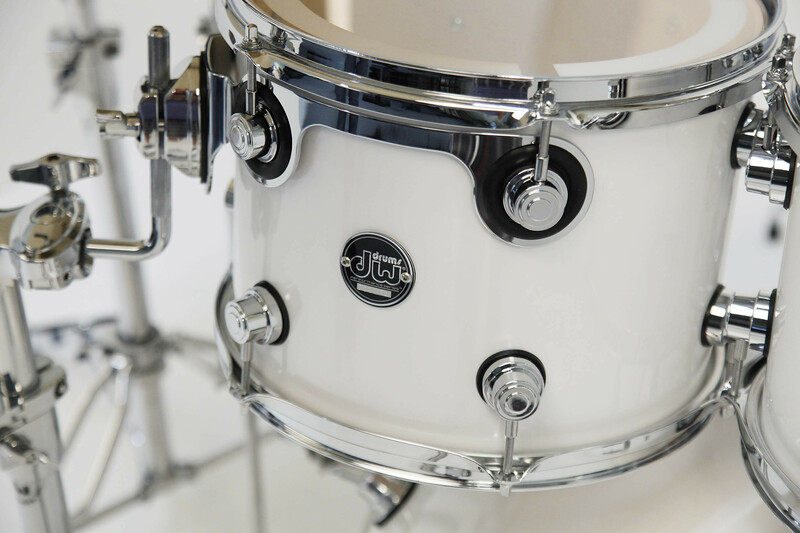 In addition to a new shell design, Performance Series drums also feature a new look courtesy of scaled-down version of DW’s trademark turret lug, called a “Quarter Lug”. The snare drum even features a new dual-mini turret lug. The snare also features DW’s new MAG drop throw-off and heavy-gauge flanged steel counter hoops. The set comes equipped with graduated counter hoops: 8”& 10” are 1.6mm, 12” to 16” are 2.3mm and the 14” snare drum is 3mm. Other professional grade features include, True Pitch Tension Rods, STM (Suspension Tom Mounts), die cast claw hooks, DW heads by Remo U.S.A. and five distinct hand-sprayed lacquer finishes: White Ice, Sapphire Blue, Cherry Stain Lacquer, Ebony Stain Lacquer and Black Mirra. Performance Series drums are available in two tom packs: 8x10, 9x12, 12x14, 5.5x14” and 9x12, 14x16, 6.5x14”. Either can be matched up with a choice of a 16x20, 18x22 or 18x24” bass drum. Available add-ons include: 7x8, 8x10, 12x14, 14x16” toms and 5.5x14 and 6.5x14” snare drums. Retail price for a typical 5-piece set with 10,12,14” toms, 5.5x14” snare and 22” bass is $2999.99. For further information visit Drum Workshop, Inc. online at www.dwdrums.com. Alesis DM6 USB Express Kit Alesis announced the DM6 USB Express Kit, the M6 USB Express Kit is in stores and available for purchase now. Spaun Drums LED Lighted Acrylic Drum Kit Spaun Drum's latest development is an LED Lighted Acrylic Drum Kit, featuring a multi-colored light system that can be operated via remote control.